Create art that moves, shakes, and delights. LiquidFun Paint is a creative application created to demonstrate the use of LiquidFun, an open source technology that provides developers with a liquid particle system and physics simulation. You can find out more about LiquidFun at http://google.github.io/liquidfun/. The liquid paint tool lets you fill up a scene with multicolored fluids that flow, drip and slosh realistically. The sticky paint tool lets you draw images that will not move or be affected by fluids. The dry paint tool lets you draw objects that will float, bob, and move with the fluid. Start playing and see what you can create! 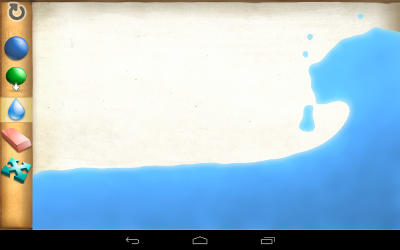 Releases of LiquidFun Paint are available for download from the Google Play Store. LiquidFun Paint source code is available for download from http://github.com/google/liquidfunpaint. LiquidFun Paint's documentation consists of Build Instructions and Programmer's Guide. Build Instructions: Use these after downloading the library's source. This document describes how to build the library, examples, and unit test binaries from source for each target operating system. Programmer's Guide: Contains descriptions of LiquidFun Paint components. Discuss LiquidFun Paint with other developers and users on the LiquidFun Paint Google Group. File issues on the LiquidFun Paint Issues Tracker or post your questions to stackoverflow.com with a mention of liquidfun paint. The usage of LiquidFun Paint is not tracked. However, the usage of the LiquidFun library is tracked by default, though you can remove the tracking if you wish. Please refer to the LiquidFun Readme for more details.